UK NEWSPAPER AND magazine publishers sought a last-minute court injunction today to stop a mechanism backed by politicians to regulate the press from being approved later. 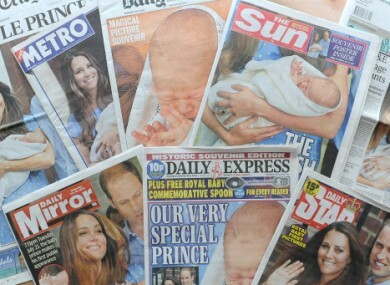 The newspapers are seeking permission for a legal challenge over a decision to reject the industry’s own proposals for a so-called royal charter to oversee a new system of regulation. The 11th-hour attempt at the High Court in London is aimed at stopping ministers from seeking the Queen’s approval for a rival royal charter that is backed by politicians. It was drawn up by Britain’s three main political parties, but is fiercely opposed by most of the newspaper industry. Ministers are due to go to the Privy Council, the formal body of advisors to the queen, later today to seek her green light. But if the newspapers succeed in their application for an interim injunction, the process will be put on hold until the legal challenge has been heard. Coincidentally, the High Court hearing falls on the day that the prosecution opens in the trial of key figures accused in the phone-hacking scandal that sparked calls for tougher regulation of Britain’s pugnacious press. The main defendants in the trial are Rebekah Brooks, a former editor of the defunct News of the World tabloid and a close confidante of its owner Rupert Murdoch, and Andy Coulson, who also edited the paper before becoming Prime Minister David Cameron’s media chief. Newspaper owners argue that the proposals backed by the government and anti-hacking campaigners are an attempt to introduce a degree of state control to an industry that is currently self-regulated. Roger Alton, executive editor of The Times, told BBC radio that the Independent Press Standards Organisation, the new regulator supported by the newspaper industry, would be a tough watchdog. “It is extremely tough, it’s a contract-based system. You sign a contract into the regulator and you are liable for extremely severe fines,” he said. He said the government-backed proposals were “extraordinarily depressing”. Email “UK newspapers go to court to block press regulation system”. Feedback on “UK newspapers go to court to block press regulation system”.